The Kobra seated electric scooter is the ideal long-range commuting scooter. Powerful, stable, comfortable and stylish, it takes you where you need to go. The powerful 500W peak-power motor accelerates with no hesitation, and a built-in cruise-control function allows you to maintain safe speeds effortlessly. With a key-ignition, you can conveniently park the scooter without having to lock it. You have not ridden anything like it before. Come test ride the Kobra in our showroom. Watch a thorough review of the KOBRA by respected tech reviewer Ben Schmanke of AuthenTech. With a longer wheelbase than most stand-up scooters and large 12-inch wheels, the Kobra is perfect for mid to long range rides. Great for both the daily commute or the leisure ride. Striking yet understated at the same time, the Kobra looks at home anywhere in the city. With motorbike-style key and ignition, the Kobra lets you park it for short periods without having to lock it as you go about your errands. The LCD dashboard shows everything you need to know. A powerful headlight and built in tail lights increase your visibility at night. Bicycle riders will tell you that disc brakes give you more braking power than drum brakes. The Kobra is mounted with disc brakes on both the front and rear wheels. Even though the Kobra has a high ground clearance that crosses humps without scraping the bottom, it maintains a very natural riding geometry that makes it easy to put your feet down when you stop. The saddle of the Kobra is spacious and cushiony, supported by a rear spring suspension which absorbs whatever those bumpy roads throw at it. The rear suspension can be adjusted for stiffness if you find yourself bouncing around too much. This modern design feature is usually found on high-end motorcycles, bicycles or electric scooters. It reduces weight and looks great at the same time. The KOBRA has been modified to meet Singapore's regulations and is LTA compliant to be sold in Singapore. Read the full review and detailed discussion of the features of the Kobra at the SG Electric Scooters blog post. 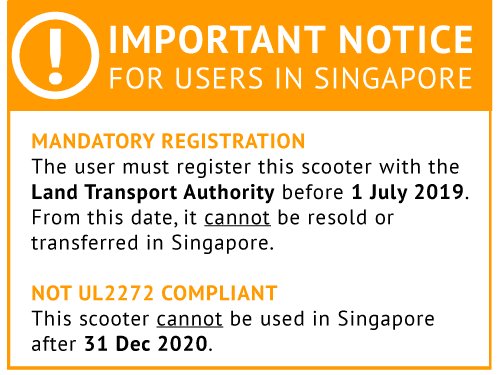 *the 12ah version is not compliant for use in Singapore.